Do you have the most important virtue needed to make it online (or off)? Do you know what your marketing gig may look like tomorrow? How about next year? Also, Louis CK, Google+, and some of the best writing advice you’ll ever read — right here, right now, in The Lede. 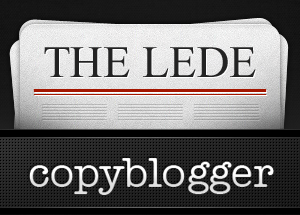 Follow @copyblogger on Twitter to grab these links – and a lot more – throughout the week. Are you throwing a desperate hail mary into a crowd of strangers, or regularly talking to friends that have come to know, like and trust you? Basically, listen to Brian Clark when he talks about the rise of the Entreproducer. More on what that term means for you (and me) later. You may think this an obvious choice for an internationally famous comedian with millions of fans and mainstream acceptance. I’d agree with you, it’s a choice that many of us (without a fraction of his mojo) have already made. Soon, this may be the only choice, no matter who you are. Bilton’s take here is right on. Google is — and always has been — playing a much bigger game than anyone gives them credit for. Sit back and soak this one in. Yes, this is advice from writers of fiction, but it’s all grist for the mill. Really. How easily we forget the old faithful and most effective marketing campaign of all — word of mouth. Probably the greatest blog post ever written regarding working on the web. Note the date of publication. Oh! Very valuable information is posted. Thank you so much for sharing this post. One thing that I think a lot of people forget is just how blurry the distinction between word of mouth marketing and social media marketing is becoming. I mean, the article even cites a few stats that involve mentions of “word of mouth” marketing on social media. It’s not easy to parse the two. I love this post from your list: What’s Required of the Next Generation of Marketers. It reminds me that businesses should consider hiring marketing technologists these days. Thanks for sharing them and I’ll be looking forward for more. Cheers! I have to agree with Aaron Eden on this one. Most businesses tend to think that once their crappy 5 page website is up and running, that they are done! LOL….if only capitalism was NOT dog eat dog…. Nowadays, you have to constantly stay on your competition, but there are only so many hours in the day, hence the need for an in-house marketing tech programmer or inclusion of SaaS services. All in all, the more the merrier…and merrier for savvy business owners’ pockets, too! My favorite is Seth Godin’s post. It touched me deeply. Hmn,Interesting and highly educative post. Enjoyed the post, “Writing Advice From World’s Most Prolific Authors.” Jack Kerouack’s advice about trusting your pen and “everyone is a genius” still rings true. Quite encouraging to me..thanks. Godin’s Secret of the Web is a fantastic reminder to bloggers. Stick with it. Deliver value. Don’t be distracted by the get rich schemes. You will succeed.